We help you maintain your sanity by always keeping your garage door running smoothly. Looking to replace or repair your garage door opener? We got you covered! Make sure you’re fully aware of the dangers of having garage door springs that are not in good shape. A lot of garages are often used as the main entry point to the house. This is why the garage doors tend to get overused. But with regular maintenance care, you will be able to prolong the life span of your garage door. We make sure to provide only the best preventive care for all your garage door's needs as we know how important it is. Make sure to give us a call and we will send an experienced technician over to check out your garage door. Garage Door Repair Agoura Hills is the go-to company for all things garage doors, from repair, installation and replacement to mere maintenance. Our company takes care of customers and knows how to meet their requests and high standards. Today, garage systems need dynamic professionals with expertise and the knowledge to deal with problems as quickly as possible. As an experienced service provider, our company has fully equipped vans and emergency technicians for same day services and can be of valuable assistance every time you are looking for answers or want consultation. You can rely on our professionals whenever the door sags or doesn't work to your satisfaction. We excel in garage door opener troubleshooting, are familiar with all brands and have the skills to locate the problem. We offer fast repair services, are committed and ready to assist you properly. What makes our Garage Door Repair Company in Agoura Hills the best option for you is its devotion to all clients' needs. We don't only know how to adjust springs and align sensors, but make sure the job is done with thoroughness and precision. Do you know why our professional services are important? We know how to solve problems, but we also know how to keep them away from your home. Garage door parts are usually made of steel and steel rusts over the years if it is exposed to humidity. As parts age and get worn, their capacities diminish. They start making noises when they are poorly lubricated or their material is cracked and damaged, and will eventually lead to the mechanism breaking down. That's why good maintenance is required every once in a while. We don't just offer great lubrication maintenance but perfectly check every single part in order to see whether the material is already worn or how long it will last. With regular routine services, we keep the whole mechanism tuned-up and prevent problems by replacing the damaged components before they start acting up. We work for you, your interests and your benefits. We can save you the hassle and open the door to happier days. Are you worried about malfunctioning garage door openers or worn cables? 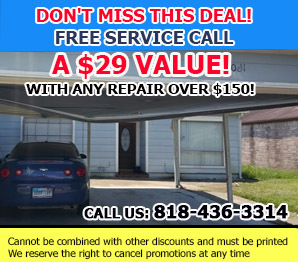 In these and similar situations, customers use our garage door repair services which are readily available to everyone in zip code 91301. In addition to proficient repairs, we provide first-class professional replacement, and maintenance in California. Opener intercoms provide two way communication with anybody trying to gain entrance through your garage door, and generally act as a functioning opener operation panel as well. They are essential for home or office security since they help you keep tabs on your visitors, and a lot of intercom systems even use various visual components like one way or two way cameras which allow you to actually see for yourself who is on the other end.